This canvas is one of the most famous paintings of the Restoration in Piedmont, already in 1829 was presented in the Turin Exposition. 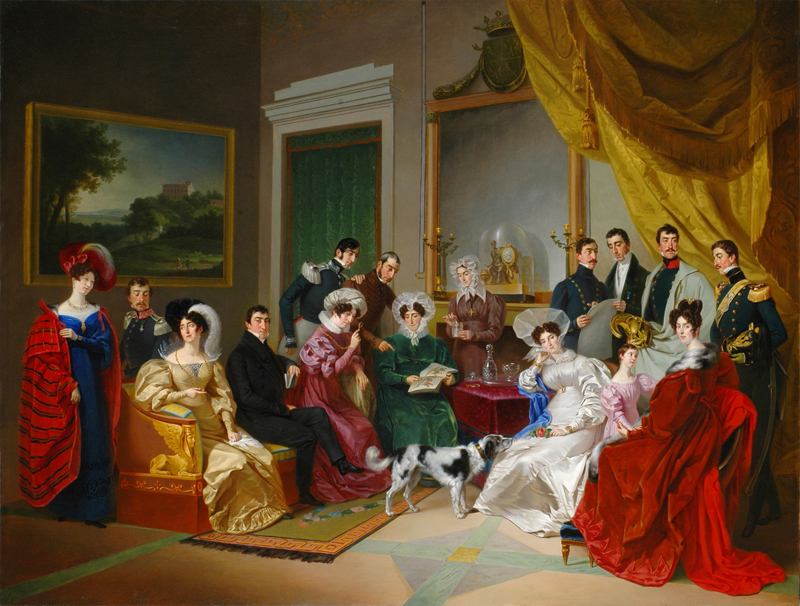 In the center is the mother Raffaella with two daughters, a granddaughter and twelve of his sixteen children, among them there are the four generals who contributed to the unification of Italy and who where preminent members of the aristocracy of that time. Absent the father Celestine, who died in 1805. This painting assumes a special simbolical meaning on the occasion of 150anniversary of the Unification of Italy years 2011-2012. In fact it was lent by the family Alberti La Marmora for the two previous anniversaries of the Unification of Italy: in the 50th anniversary, 1911, the painting was part of the exibition on the Italian portrait held in Florence. In 1961, one hundred years later the unification, the painting was exibited in Palazzo Carignano in Torino.